1. Early Bird Draw of $1,000 is December 1st, 2017. To be eligible for the Early Bird Draw tickets may be purchased online or in person at the draw location by 7pm on December 1st 2017. 2. Prize winner may choose one of three options: Choice of one of two trips valued at $3,000 based on double occupancy, a Maritime Travel Gift Certificate valued at $2,000 (no expiration date) or Cash amount of $1,500. No cash value on trip taken and no refund if booked and not used. 4. Trips must commence within 120 days of draw date (first day of the month won). Please book as early as possible due to limited space availability. 5. Canadian passport required valid for 6 months past the date of expected return for international travel. 6. Trips offered were available at the time of printing of tickets and space is subject to availability at time of booking. Blackout dates may apply. Maritime Travel has the right to offer different dates along with an alternative property if the package offered is not available as bookings are subject to change and availability. 7. Maritime Travel will offer and may be purchased by winner, if needed: air and transfers for cruise or tour option; advance seat selection on flight, local tours or excursions; cancellation and medical insurance packages along with stop-over hotel parking packages. Winner is responsible for any locally collected departure taxes or fees. 8. A second ticket will be drawn each month for a $100 consolation prize. 9. In case of dispute, all decisions by the Rotary Club of Sarnia, Ontario, Canada are final. 10. 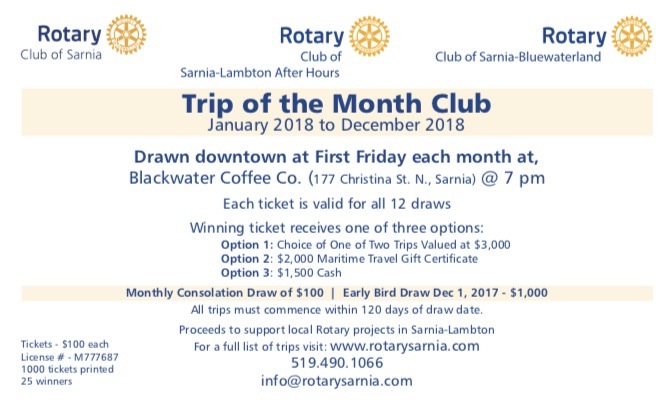 Ticket purchaser gives permission for the Rotary Club of Sarnia to publish their name if drawn as a winner.